The Comelec in partnership with Smartmatic and Iplus issued a notice a few months ago, between the second week of January. – gathering names of possible candidates and by the third week February, this year – commencing training, calling Vote Counting Machine (VCM) Technicians, Technical Coordinators applicants – whose primary job functions and descriptions are, is, to oversee the smooth, functional operation of the machine namely the Vote Counting Machine or the VCM, replacing the outdated Precinct Count Optical Scan (PCOS). But first, before we start, let’s define the terms used, what is a VCM? How do they differ from the PCOS? To cite few examples; the VCM has a colored LCD Display, lights up and show technical details of the machine, i.e. ; on display, comelec logo, vcm serial number, school assigned, hash codes, among other lengthy details worth every mention, a security button – iButton, SD Card slot for housing main SD CARD and Backup SD Card, Advanced Optical Scanner capable of reading ballots in either top or bottom positions when the ballot is fed, the scanner has a security add-on feature that can detect ballots for ambiguous marks, as a precaution is ejects the offending ballot for correction, the ballot contains timing marks, bar code details, security threads, ensuring that the ballot is genuine of origin, a battery backup with color coded electrical and wiring clips– in case of power loss or interruptions. In addition to its features, the VCM has Ethernet (LAN) – for Broadband Global Area Network (BGAN) modem on remote areas where signals are hard to reach, USB ports, etc. for sliding in or inserting USB Broadband Sticks from big telco networks like SUN, GLOBE, SMART, for transmission of results over the internet. PCOS in the other hand lacks some of the features mentioned above with the exception of green monochrome screen. 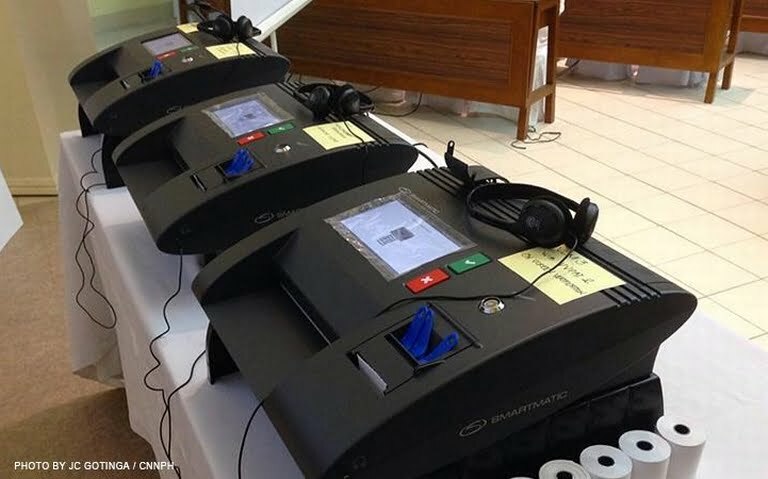 Let’s begin; VCM stands for Vote Counting Machine: an electronic device develop by smartmatic, designed for casting, recording, counting ballots of your preferred candidates of your choice. So what does a VCM Technician got to do with it? Manage the operation; provide technical support when the need arises, and follow protocols from Comelec. The skills needed in order to qualify are as follows; at-least Information Technology, IT capable individual, knowledge – understands the inner workings how computers work both hardware and software, hands-on experience a plus, most important of all – MANNERS, attitude towards work, team mates and supervisor. Pay Attention: always listen with care to presentations discussed, avoid being distracted with your neighboring seat mates, turn off mobile phones or better yet set it to silent mode. 2. Take Notes: Has a notebook or any piece of paper for jotting down notes, writings; you can’t memorize everything by head, so write. Read: this does not simply mean reading the manuals of the vcm, but rather reading articles related to technology, newspapers, online journals, tech blogs; these can help you with unfamiliar terms and abbreviation. Be on Time: respect the presenters or trainers time, each lesson is timed on schedule, missing out important topics when coming in late, catching up with the rest is time consuming and frustrating, stressful on the part of the trainer. 5. Be Prepared: always bring with you contingencies, these comes in a form of pocket money, know the place and address you’re going to travel in serving the election, try google maps to the rescue on your mobile smartphone, a charge mobile phone, power bank, extra load allowances for calls and sms texts for escalating issues in the field. A famous survival quote “expects the unexpected, prepare for the worst, hope for the best”. Be Confident: stage fright is a problem for some first time reporters, don’t be afraid, get to know the machine better, ask questions from the audience and present solutions. Relax, stay calm. Mind your Manners: You can teach anybody a particular set of skill, be perfect at it, it can be taught, honed, practice, but I’ll manners in handling sticky situations with subordinates or your immediate head are a big NO! There are things you say in person that you do not post or publish on social media, this will excite flame, word wars – practice etiquette, if you think you are better than him, then don’t belittle him, don’t expect too much, mind you, you may not know why the supervisor or coordinator wasn’t able to answer up your calls or sms text, for some reasons he might be attending some life threatening issues on the field of work. Once you have successfully passed all two exams, you’ll be issued a certificate administered by your trainer-examiner from iPlus, Smartmatic, a master-list or registry is created from a pool of qualified applicants and submitted to Comelec, Comelec in turn will opt to choose and pick these applicants and assign them to school precincts. Part 1: Basic computer fundamentals, information technology terms, abbreviations, definitions of terms, terminologies. Part 2: Discuss, demonstrate parts of the VCM, uses, analysis, remedies, troubleshooting issues, question and answer. Update: June 26, 2016, The salary, compensation, payment, honorarium, bonuses, etc. entitled for the vote counting machine (vcm) technicians and technical coordinator/s personnel who served last May 9, 2016 has not been settled yet by iPlus – the third party manpower resource agency. It’s been a month now.